First off, I must say that our baby is doing well (See here if you don’t know what I’m talking about). She’s been out of the hospital for about 6 weeks, but with her feeding schedule and my increased responsibilities at work have curtailed my ability to write recently. 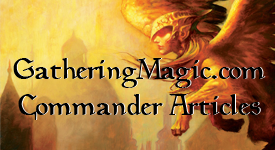 But there’s a little wiggle room and I wish to bring both this blog and mtgcolorpie.com back. And we’re going to start off (semi)-easy here. See that 2:30 am time stamp? That wasn’t because I was just hanging out at night for fun. Since our baby was born in late November I obviously haven’t been as focused into Commander. 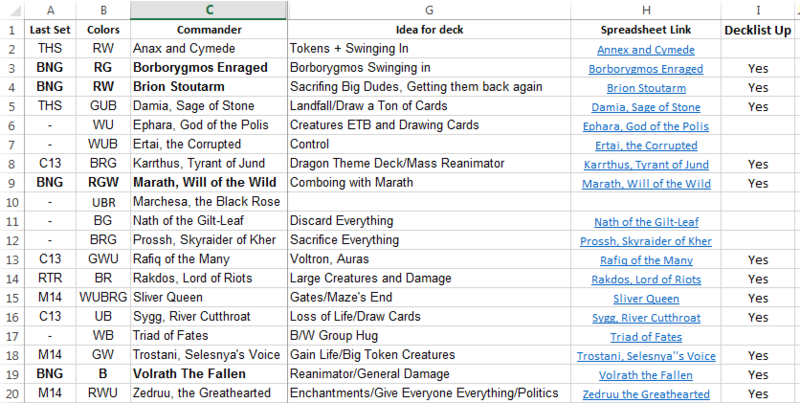 I need to update or build all of these decks. And this is where I would like some input from you. What deck should I update first? This is where it concerns you. If I have the deck built, I’ll update it through Conspiracy and walk through the steps of what I did and what choices I made. It’ll give you a little insight into some deckbuilding which I know that a portion of you readers like. Plus, it’ll be content, and I know that would be good for us all. So vote and let me know what you think. I need to put the 3:00 am feedings to good use; I’ll ease back into the writing.